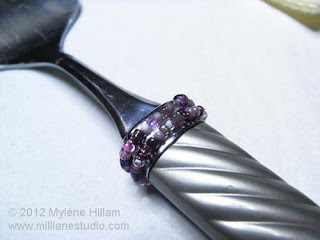 Mill Lane Studio: Jewellery..... For Your Table? Being a jewellery maker, I have been thinking how fun it would be to have beads on my dining table. And in particular, wouldn't it be fun to have beaded serving ware. So that's the next project on the list for my celebratory dinner table. It's a simple decorating idea that will tie in nicely with the purple theme I've chosen. 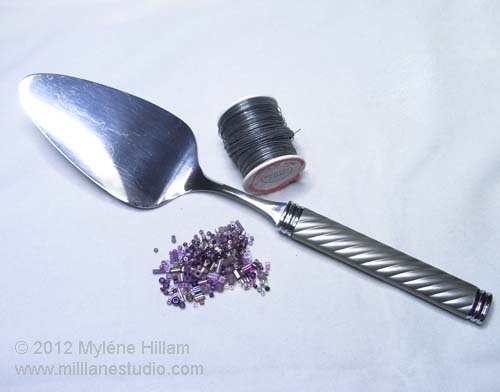 I have a platinum coloured cake server in my buffet which is the perfect base for this project. It's my favourite server but it only comes out on special occasions and this is definitely a special occasion. I've gathered some 24g platinum coloured wire and a selection of purple seed beads. Because this server has a rounded handle and a lovely pattern I decided to keep the beading really simple so it doesn't get too bulky, but if you have a flat server, you could really go to town with the beads and decorate the whole handle. 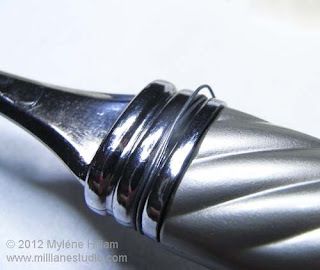 All you need to do is wrap a length of wire around the grooves of the handle a couple of times to secure it. 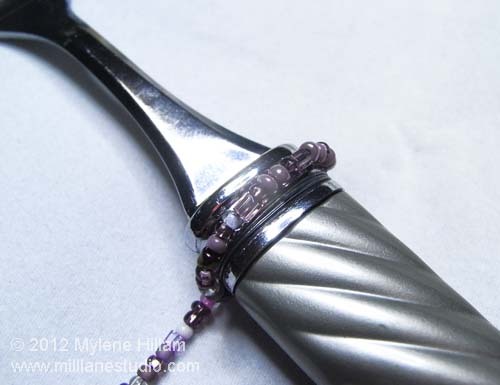 Then thread on the beads and wrap it around the handle so the beads sit in the channel. 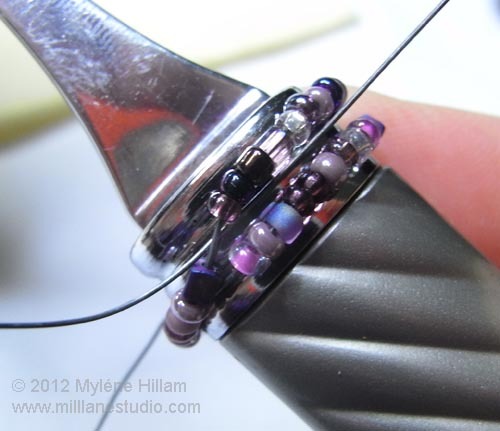 To secure, wrap the end of the wire over and under the beaded wire and then pull it firmly. Wrap it around the handle again and then thread it through a couple of beads before trimming it closely to the beads so the wire doesn't stick into any one. Make sure you tie off the wire at the back so the front is nice and neat. 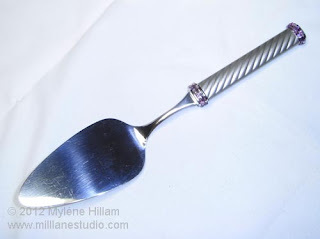 Repeat for the bottom of the handle and you have a simple but elegant cake server. To make this more permanent, you could secure the beads to the handle with glue but keep the handle away from water to avoid getting moisture on the wire. Rust might be a trendy patina to add to your crafting projects but doesn't belong on your food utensils! I'm not gluing my beads in place because I want to remove them later on. This was such a quick and easy project and from start to finish it took less than half an hour. But as with all beading projects, I'm now hooked and looking for more serving ware that I can decorate. Check back later in the month to see what other dining table items I have in my sights.